The Martin Mania DC1 is a light fixture that projects brilliant decorative fluid effects. Ideal for shows, clubs or simply your own personal party, the Martin Mania DC1 will wash liquid light through the crowd, the lounge, across walls and over bars. With three selectable colors plus white, the DC1 gives you split color options for a truly awesome mix. A variable focus also allows you to frost and blur the projected image while a variable speed of effect gives you the option of ranging moods - from a silent trickle to a surging waterfall. Best of all is the Martin Mania DC1’s incredible capacity for stamina. 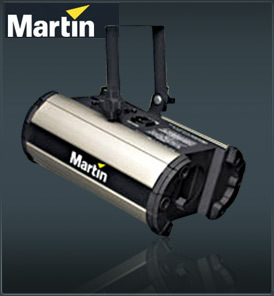 Unlike most lighting fixtures on the market the Martin Mania DC1 has no duty cycle, which means there are no cool down periods and no stopping the show. Why bother with decorative lighting that needs to be shut down every 15 minutes leaving holes in your décor? Like the crowd, the Martin Mania DC1 doesn’t need to rest, so you can keep it shining all night! Through the opening of another solely owned, high tech production facility in China, Martin is able to produce the Martin Mania DC1 below the cost of its competitors. Giving you a clear passage to the tools you need to color your show, club or party.